Many people rates Infinix company as one of the best smartphone company worldwide. Before now the speculation about the new infinix device nicknamed Tag #WefieMaster, the device has now been unveiled and it Carries the name infinix S2. It's packs 5.2 inches device, accompanied by dual front camera with a setup that produces wide angle selfies. 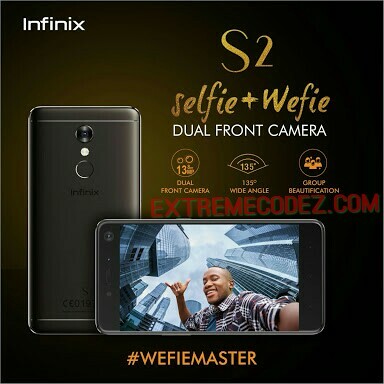 Probably the new Infinix S2 phone nicknamed is #Wefiemaster. It allows you capture special memories with its dual front facing camera and wide angle capabilities. It also comes with Android 7.0 pre-installed, 13+8MP front camera, 16GB and 2GB of RAM. In terms of sensors, the Infinix S2 supports Fingerprint, Accelerometer, Ambient Light, Proximity, Gyroscope sensors and for the price? infinix S2 price in Nigeria is approximately ₦61,000. Infinix S2 is powered by 64-bit Octa-core 1.3 GHz Cortex-A53 Mediatek 6573 processor and packs dual 13-megapixel front camera (wefie) for an amazing selfie experience while at the back it also packs 13-megapixel shooter. The handset comes in three color options which are Gold, Rose Gold, Black. So you have plethora of colors to choose from. It's a bit much cheaper than the Tecno Camon Cx launched by Tecno mobile earlier this year.